The trend at the end of the 1930s was toward smaller and smaller sets at the introductory end of the price spectrum. At the minimalist extreme were two-tube TRF sets from Arvin and Emerson, but Philco's Transitones offered robust five-tube performance squeezed into a similary tiny cabinet. 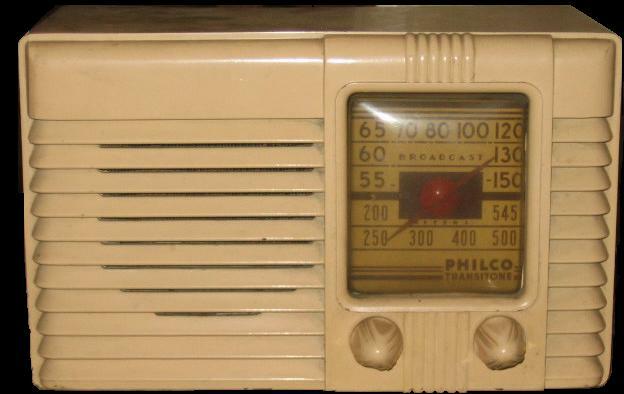 This radio was purchased on eBay in 2006. Maybe at the time I was still naive about the eBay definition of "working"; I was certainly disappointed to discover upon unpacking the radio and plugging it in that it did nothing but hum. Loudly. That disappointment was compounded by my first glimpse of the underside, as seen above center. The circuit used in these radios is really very basic and simple, so simple it should be posssible to design its component layout in such a way that only a very small amount of hookup wire is necessary. 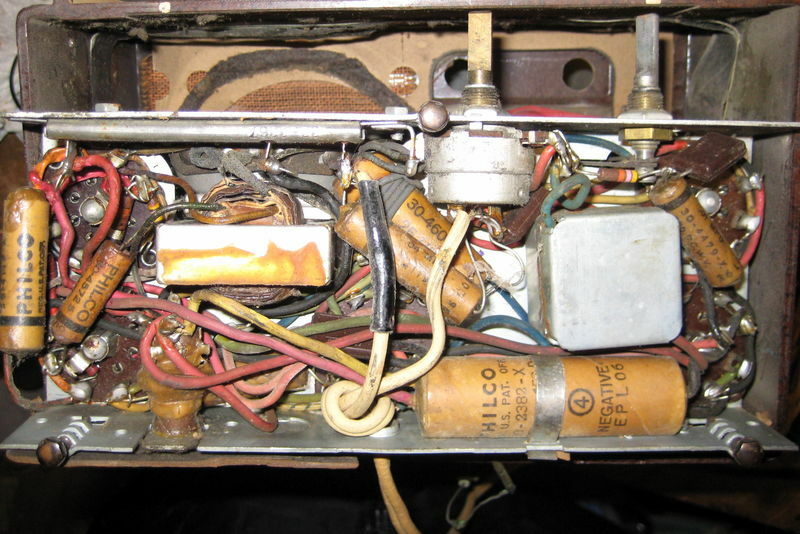 Instead, not only is an abundance of wiring run around and around things that might poke it, Philco in its infinite wisdom used rubber wire which, after 70 years of drying, cracks when you look at it. Dreading the task ahead I put the radio in the bottom drawer of my desk and didn't look at it again for five years. When at last the day came for this project, it was a relief to find that much of the rubber wire was still supple enough to bend easily without cracking. However just a bit of pulling on the wiring under the hot sockets of the rectifier and ouput tubes resulted in the sorry scene at left. 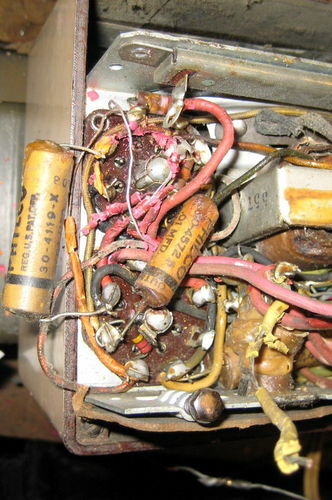 All the wire that crumbled easily was replaced along with the electrolytic and paper caps and resistors out of tolerance by more than 20%, which surprisingly was only a couple of them.